SPIRITS with SPIRITS is BACK! The building we know today as the “Magic Castle” was built in 1909 by banker, real-estate developer and philanthropist, Rollin B. Lane. According to urban legend, the Lane House was the only home built from a failed housing development that proposed to cover those hills with similar Chateau-themed mansions. It is said that the historic Chateau-style Janes House (the oldest house in Hollywood) was the “model home” and sales office for this doomed real estate venture. Fortunately, this French-inspired “castle” wasn’t alone very long, because two years later the equally bizarre Japanese-inspired “Yamashiro” was built up the hill, above it. To help us explore this secret haunted side of this historic hide-away (the side that the magicians would rather not talk about), Tom Ogden, author of “Haunted Hollywood,” will share with those present these little known ghost tales for a casual ghost tour of the labyrinth-like premises… and perhaps during the evening a few spooky magic tricks will be thrown in for good measure. 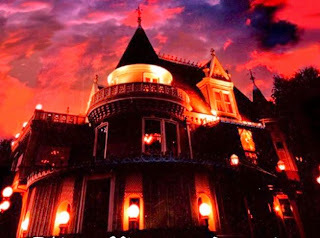 So come out, and join us for this very unique glimpse inside “the most unusual private club in the world,” and all of its other-worldly members… If you dare!